Endicott was able to pick up a win over Nichols over the weekend and there were a good amount of Hockomock alums, including arguably the best defensive player on each team. For the Gulls, Franklin grad Craig Anderson recorded a team-high seven tackles and broke the single-game program record for sacks with four total for 14 yards lost. Anderson was named the NEFC Defensive Player of the Week. On the other side of the ball, King Philip grad Brett McEvoy had 13 total tackles for Nichols, a half a sack and an interception that he returned 51 yards. Foxboro’s Nick DiTullio recorded a tackle for Endicott while Attleboro grad Brenden Massey hauled in a pass for six yards for Nichols. Mansfield alum George Busharis was nearly flawless while leading Castleton to a big 35-30 win over Alfred State on Homecoming. 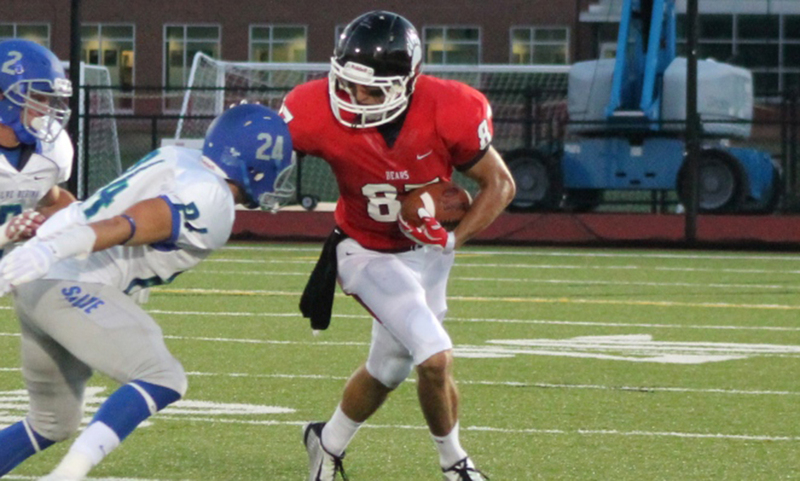 In front of a record crowd, Busharis was 18-20 with 239 yards and four touchdowns. Busharis had touchdown passes of 21, 69, 2 and 51 in the win. On the season, Busharis has tossed six touchdowns and nearly 700 yards. Fitchburg State enjoyed a big 35-3 win over Bridgewater State over the weekend. Taunton’s Asante Easter had six tackles for the Falcons and also had a pass breakup. Former Oliver Ames All Star Nick Cidado, who is a sophomore at Bridgewater, got the most reps of his young career. He went 4-9 for 22 yards while two other OA alums Carlton Williamson (76 all purpose yards) and Cameron Williamson (5 tackles) also contributed. Sharon graduate Adrian Lingo booted a 26 yard field goal in the third quarter to put Worcester State ahead but Mass. Maritime scored in the fourth quarter to take a 35-31 win. Sharon’s Adam Banks, Stoughton’s Brian Crimmins, Mansfield’s Alex Ruddy and King Philip’s Chris Winbourne all played for the Buccaneers in the win. In the loss, Mansfield’s Aurian Dawkins had six tackles and Dylan Finerty had four tackles, including one for a loss, for Worcester State. Milford’s Eric Nunez was 3/3 on extra points and had four tackles for Worcester State. UMass Dartmouth emerged with a 29-13 win over Plymouth State on Saturday afternoon. Canton’s Anthony LaRose led the Corsairs with three sacks for a total of 21 yards lost and Taunton’s Marcel Flynn chipped in with a pair of tackles, including one for a loss. Foxboro’s Alton George was a bright spot on defense for Plymouth State with six tackles, one of which was for a loss. Only four players have started every game for Assumption this season and Franklin grad Zach Scafati is one of them. The former HockomockSports Kelley-Rex Player of the Year has one goal on three shots on goal while the Greyhounds are 1-6-1 this season. Former Canton standout Scott Levy is having a strong senior campaign for Bentley so far this year. The Falcons are 3-4 but Levy is second on the team in points with two goals and three assists. Levy has started in all seven of Bentley’s games and is third on the team in shots with 11. Bridgewater State is on fire right now, currently riding a seven game win streak. Foxboro’s Sawyer Fleck has started in all eight games this season and is third on the team with three assists. Sawyer’s younger brother Riley Fleck has appeared in a pair of games for the Bears this season. Mass. Maritime is off to a 3-4 start this season with a trio of Hockomock players contributing. Mansfield’s Taylor Sjorberg, who is a captain for the Buccaneers this year, has started all seven games so far while fellow Mansfield alum Alex Thompson has appeared in all seven games and has an assist. Attleboro’s Eoin Grimes, who missed all of his freshman year due to injury, has appeared in five games with four starts. A pair of former Bombardiers are teaming up for Rhode Island College this Fall. Steven Cataldo has appeared in a pair of games and has a pair of shots so far. Thomas Wampler has started four games with five appearances total and has netted a pair of goals this season, tied for third on the team. North Attleboro’s Jamie Grinavic has only started in one game for Bentley this season but has proved to be a super sub for the Falcons. Grinavic has appeared in all seven goals and has scored twice, which is tied for third on the team. Former two-time HockomockSports.com Girls Soccer Player of the Year Taylor Cogliano is making an impact at Merrimack. She has appeared in all eight of the Warriors’ games so far this season and picked up her first collegiate point with an assist on Merrimack’s game-winning goal against LIU Post in early September. Canton graduate Kim McNally is having a big impact for Sacred Heart’s defense in her sophomore campaign with the Pioneers. Despite Sacred Heart’s 3-6 record so far, McNally has been one of the anchors for the Pioneers’ defense having appeared in all nine games with seven starts. After dominating on the basketball court for her first two years of college, former North Attleboro star Meg Ronaghan is back on the volleyball court. In her first season back playing volleyball, Ronaghan is currently leading the Corsairs 145 kills, nearly 40 more than the next highest. She also has 17 blocks, 76 digs and three aces as UMass Dartmouth is 7-9 this season. Former Oliver Ames stand out Molly Cunha is making a big impression during her first year for LIU Post. The Pioneers are ranked #8 overall in D2 this season and Cunha has netted a pair of goals in six appearances, which is tied for second on the team. Meanwhile, Duke field hockey is ranked 6th overall in Division I and Attleboro’s Kelsey Wagner is a member of the Blue Devils. Wagner, a goalie, made her first career appearance this season and allowed just one goal. Bridgewater State started off their league schedule with a big Worcester State and there were Hockomock ties all over the field. In the Bears’ 34-28 win, King Philip alum Michael Viola hauled in three passes for 104 yards and a pair of touchdowns and OA grad Carlton Williamson had nine carries for 48 yards and three catches for 61 yards for a team-high 125 all purpose yards. Defensively, Cameron Williamson was third on the team with seven tackles, three of which were for a loss, and also forced a fumble. Stoughton grad Manny Chery and KP’s Christian Flaherty each had a tackle for BSU and OA’s Nick Cidado had six punts for 213 yards (35.5 average) and locked the Lancers inside the 20 once. For Worcester State, Mansfield’s Dylan Finerty finished with eight tackles (second on the team), Milford’s Eric Nunez had three tackles, including one for loss and Sharon’s Adrian Lingo had a 35-yard field goal, an extra point and a pair of tackles. Former Oliver Ames standout St. Clair Ryan had his best game of the season for Anna Maria. In a 23-16 setback to Curry, Ryan had 33 yards on the ground on 10 carries and also had a 10 yard kickoff return. In the win, King Philip alum Christian Vellante had three tackles. Former North Attleboro star Paul Norris had a big game for Bentley over the weekend. Norris, a captain for the Falcons, had five tackles including an 11-yard sack. Norris forced a fumble and also had a fumble recovery. Attleboro’s Chris Walsh had four receptions for 20 yards and also got a pair of rushes. Brown opened up its season with a 20-16 setback to Bryant over the weekend but a former Hockomock League All Star still made an impact. North Attleboro’s Alex Jette hauled in a team-high seven receptions for 84 yards, including a 23 yard reception. Jette also had a rush for 10 yards. Salve Regina picked up a 32-14 home win over Castleton over the weekend and there were former Hockomock players on both sides. For Salve, Franklin’s Dan McDermott picked up a tackle and also had a rush. Franklin’s Robert Dellorco also saw time in the game for Salve. For Castleton, Mansfield’s George Busharis went 18-29 for a 165 yards and also had a 1-yard touchdown run in the first quarter. In game that involved over a dozen former Hockomock stars, Attleboro’s Tommy Burns came up with his biggest game yet for Framingham State in the Rams’ 34-21 win over Fitchburg. Burns had two interceptions in the game and also had four tackles. Foxboro’s Derek Gilreath recorded a tackle while King Philip alum Brian Donahue and Stoughton’s Joe Wilder also saw time for the Rams. For Fitchburg, Taunton’s Asante Easter had a pair of tackles, Canton’s Sterlin Garvin notched one tackle while Foxboro alums Gerard Darcy and Ty Spencer both played. Springfield picked up a dominant road win at Mount Ida on Saturday afternoon. There was plenty of impact on the defensive side of the ball from Hockomock alum with OA’s Colin Lozzi leading the way with four tackles, a sack and a forced fumble. Taunton’s Nick Ruiz had three tackles and a half a sack and Stoughton’s Brandon Alves also had a half a sack. For Mount Ida, Manfield’s James Comer had five tackles and a forced fumble. Former Hockomock League All Star Brett McEvoy was named to the New England Football Conference Honor Roll. An alum of King Philip, McEvoy led the Bison with 12 tackles (seven solo), including three tackles for loss (TFL) and 1.5 sacks, in a loss on Friday night. McEvoy leads Nichols in both tackles (31) and TFL (6.0) this season. Former Taunton standout Dan Belair is one of just three players for AIC that has played all 462 minutes this season for the Yellow Jackets. AIC is off to a 3-2 start and Belair is apart of a defense that has picked up two shutouts so far this year. North Attleboro’s Luke Albertini is just one of six players who has started every single game this year for Central Connecticut State University. Albertini, a sophomore, has patrolled the midfield for the Blue Devils and has a shot on goal this season. Albertini spent the majority of his high school career playing for the New England Revolution Academy. Adam Borberly has started in all eight of Colby-Sawyer’s games this season and has played 525 minutes, which is third most on the squad. Borberly plays in the midfield as the Chargers have picked up three wins so far this season. Another former Tiger from Oliver Ames is having yet another stellar season this Fall. David MacKinnon has started in net for all seven of Hartford’s games this season and has picked up 22 saves. He’s notched two shutouts and has allowed 1.17 goals on average. Freshman Matt Rodrigues is just one of two first year players that has started all six of UMass Dartmouth’s games so far this year. The former Hockomock League All Star at Attleboro has helped the the Corsairs to a 4-1 start this Fall. Stoughton’s own Mikayla Williams has been one of the mainstays on the field for Coastal Carolina this Fall. Williams has started in six of CCSU’s eight games and has logged 609 minutes, which is second on the team. She’s also netted one of the team’s 13 goals. Former Taunton standout Victoria Floeck is one of seven players for Fitchburg State that has been in the starting lineup for all six games this season. Floeck also has netted one of the team’s three goals as the Falcon are 2-4 this season. A pair of former Hockomock All Stars and rivals turned teammates have played big roles in Providence’s 7-3 start. OA graduate Kendall Andrew has started in nine of the Friars’ 10 games and has an assists on the season. Canton’s Hailee Duserick, a freshman with the program, has started in six games and appeared in all 10. Hailee’s older sister Brianna Duserick has started in all seven of Stonehill’s games so far this year. The Skyhawk are off to a 2-4-1 start and Duserick has seen time in the midfield and in the back. She has one assist this season with two shots on target. A former Sharon star and former Hockomock League All Star is just one of five players who have made the University of Vermont’s starting line up every game this season. Meg James has started in all eight games for the Catamounts as they are off to a 3-4-1 start. James, who is in her sophomore year, started in all 17 games during her freshman season last year. Bridgewater State isn’t having the strongest of starts but Mansfield’s Alyssa Kelly has been a bright spot during her freshman year. Kelley has 74 digs so far, which is fourth on the team, in 38 sets played. Kelley has appeared in 11 of the Bears 12 games so far this season. Former King Philip star Brigid Murray continues to set Westfield State up for success this season. The Owls are 4-6 this season and Murray leads the team with 132 assists. Murray also has six aces and a kill in 29 sets played. Canton graduate Julia Murphy continues to be a rock for UMass Boston despite the Beacons slow start to the season. Murphy is second on the team in kills with 86 and also has 25 digs. Murphy has reached double-digit kills in each of the last three games for UMass Boston. Oliver Ames graduate Nick Carter has been one of St. Anselm’s top golfers so far this Fall. In the Queen City Challenge, Carter shot an 80 to place 10th. In the Bowdoin Invitational, Carter carded a 156 over two days to get 17th and at the Dowling Shootout, he shot 157 over two days for 38th overall. He’s the only golfer for the Hawks to place in all three events. Three Hockomock alums were on the winning side as WPI edged out MIT over the weekend. Stoughton’s Dan Eckler threw for 197 yards and a pair of touchdowns, completing nearly 80% of his passes. On the ground, Eckler ran for 58 yards and a touchdown. Just like last year, Eckler’s favorite target was Franklin graduate Brandon Eccher, who caught six passes for a team-high 63 yards and a touchdown. WPI junior Marcus Middleton appeared on the gridiron for the first time since high school and caught a pass for 16 yards. For his efforts, Dan Eckler was named the Liberty League’s Offensive Performer of the Week. Taunton’s Devi DeCourcey had six total tackles, including a sack, and added a pair of pass break ups to help Bridgewater State beat Curry 42-21. OA grad Nick Cidado completed his first collegiate pass and had four punts, including a long of 48 yards. Fellow OA grad Carlton Williamson was the leading rusher for the Bears with 80 yards on 13 carries. 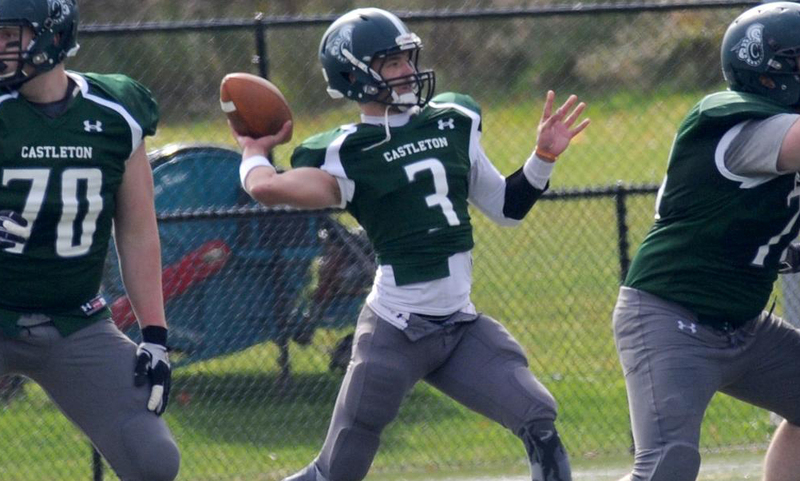 Mansfield’s George Busharis completed 26 passes for 280 yards and a pair of touchdowns in Castleton’s 21-10 season opening win over Plymouth State. Foxboro’s Alton George played for Plymouth State and recorded a tackle for loss. A trio of former Hockomock players played their way onto the box score in Framingham State’s 42-6 win over Endicott. Foxboro’s Derek Gilreath made his debut and hauled in his first career catch on a 14-yard play. Mansfield’s Greg Donahue notched a tackle for the Rams. On the other side, Franklin’s Craig Anderson had three total tackles and had a sack. Foxboro’s Ty Spencer hauled in two touchdown passes for Fitchburg State for his 16th and 17th career touchdown catches. His 17th career TD catch is now tied for 2nd on the Falcon’s all-time receiving touchdown list. Taunton’s Asante Easter had three total tackles for the Falcons while Canton grad Sterlin Garvin made his collegiate debut with a 19 yard kickoff return. There were a lot of Hockomock alum that made an impact in UMass Dartmouth’s 41-6 win over Mount Idea. Canton’s Anthony LaRose was one of the more productive players on defense with six tackles, a sack and three tackles for loss. Mansfield’s Lou Petrella added a pair of tackles with 1.5 sacks. Taunton’s Marcel Flynn had five tackles and Mansfield’s David Collins had a tackle. On offense, Taunton’s Terrence Gibson’s first college game saw him get eight carries for 30 yards. For Mount Idea, Mansfield’s James Comer had a tackle. In Westfield State’s big 44-21 win over Nichols, Stoughton graduate Pat Raeke registered five tackles for the Owls. Mansfield alum Nick Bosari made his college debut with a pair of tackles. For Nichols, Brett McEvoy started his sophomore year with a team-high 14 tackles and had three tackles for loss. McEvoy also had punting duties for the Bison, with six punts, a long of 51 yards and two punts placed inside the 20. Canton’s James Bourikas made his collegiate debut, register a tackle in Rensselaer Polytechnic Institute’s 37-0 blanking of Norwich football. Worcester State suffered a 41-28 setback to Salve Regina over the weekend. For the Seahawks, Franklin grad Robert Dellorco had a tackle. For Worcester State, Mansfield’s Aurian Dawkins had six tackles and fellow former Hornet Dylan Finerty had five tackles and a tackle for a loss. Recent Sharon grad Adrian Lingo made his collegiate debut with a pair of tackles. Western New England opened up their 2015 campaign with a 34-14 win over Springfield and one former Hock alum was a big reason for the Golden Bears’ strong defensive performance. Former OA standout Dean Soucie recorded eight tackles and also recovered a fumble. For Springfield, OA alum Colin Lozzi had three tackles and 0.5 tackles for loss. Stoughton’s Brandon Alves had a pair of tackles as well. Former Canton standout Scott Levy assisted on the game winning goal for Bentley in 3-1 win over Caldwell. Foxboro grad Sawyer Fleck recorded his first assist of the season, setting up the Bears’ opening goal in a 3-1 win. Fleck’s direct kick found the head of Jonathan Pires for the opener. Sawyer’s younger brother Riley Fleck (FHS 2015) made his collegiate debut in the game. A pair of Hockomock alums have helped the Curry men’s soccer team to a 3-0 start to the season. OA grad David Stapleton scored a goal and had an assist in an 8-0 win over Lyndon State. Before that, Stoughton’s Steven DePina had a goal in the Colonel’s 10-1 over Wheelock. Canton graduate Chris Murray collected his first two goals of the 2015 season as WPI cruised to a 4-1 win over Worcester State. Murray’s first goal came in the 21st minute off a free kick and then added his second in the 52nd minute. Oliver Ames graduate Kristina Simonson picked up two assists for Babson over the weekend. The Beavers notched a 6-0 over Simmons as Simonson had an assist in each half. Former Hockomock League MVP Lauren Berman scored her first goal for Boston College last week. After transferring from Maryland to Boston College this season, Berman scored in the 30th minute and BC went on to beat Harvard 2-1. Berman assisted on a goal for the Eagles over the weekend but BC suffered a 2-1 setback to St. John’s in overtime. Mansfield alum Kelly English tied a career-high with 12 saves in net for Nichols women’s soccer team and the Bison picked up a 4-1 win over Mount Holyoke. In Nichols’ 2-1 setback to Clark, English made nine saves in net.